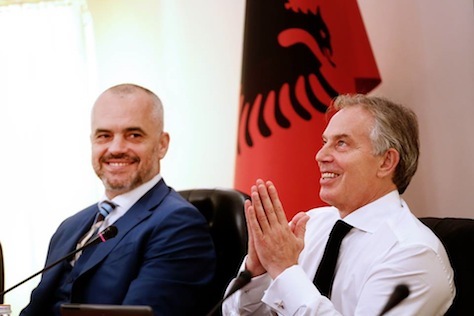 The move follows a largely successful parliamentary election in June 2013 and aggressive steps by Albania’s new, energetic prime minister Edi Rama (pictured above, left, with Blair, right) to stamp out corruption and organized crime. Albanian police moved last week, for example, to subdue Lazarat, a village in southern Albania that’s known as a chief source of marijuana throughout Europe, with an estimated annual production of €4.5 billion. Rama, the leader of the Partia Socialiste e Shqipërisë (PS, Socialist Party of Albania), led his party to a landslide victory in last June’s election, winning 41.67% of the vote and 65 seats in the 140-member, unicameral Albanian parliament (Kuvendi). But the broad center-left coalition of parties that he led, the somewhat optimistically named ‘Alliance for a European Albania’ won 57.63% of the vote, in aggregate, and 83 seats. Though outgoing prime minister Sali Berisha initially claimed victory for his own conservative party, the Partia Demokratike e Shqipërisë (PD, Democratic Party of Albania), he ultimately conceded defeat after the vote-counting finished and otherwise facilitated a most seamless transfer of power. On Berisha’s watch, Albania joined NATO in 2009 and welcomed its first-ever visit by a US president in 2007. But EU officials doubted Berisha’s commitment to reform, given the claims of fraud that marked 2011 local elections and the government’s unwillingness or inability to effectively combat organized crime. The EU decision, made in the waning days of the current European Commission, is likely the last major accomplishment under Štefan Füle, the EU commissioner for enlargement. The Council’s members, the leaders of all 28 EU member-state governments, is expected to make a proposal this weekend for the next president of the Commission — likely former Luxembourg prime minister Jean-Claude Juncker, despite Cameron’s opposition. Rama, shortly after becoming prime minister last September, brought Blair to Albanian government in an advisory capacity to boost the country’s reform efforts, ultimately designed to move the country closer to EU accession. Organized crime and corruption will remain atop the EU’s agenda of concerns as Albania moves toward negotiations and the implementation of 33 chapters’ worth of the acquis communautaire, the hefty set of laws and regulations that will harmonize Albania into the European Union. Albania is also one of the poorest countries in Europe, with a GDP per capita lower than just about every European country, with the exceptions of Ukraine and Moldova, though in some measures, Albania narrowly outpaces Bosnia and Herzegovina and Kosovo. Nevertheless, with a GDP per capita of just $4,609 (according to the International Monetary Fund’s 2013 calculation) it’s significantly poorer than the two poorest EU member-states Romania ($8,910) and Bulgaria ($7,328), and it’s even poorer than the two countries most likely to form the next EU enlargement, Serbia ($5,906) and Montenegro ($7,026). Albania’s economy, highly dependent upon the struggling Italian economy to buy its exports, has struggled to grow beyond 1% to 2% in recent years. Like Kosovo, where ethnic Albanians also form a majority of the population, Albania is one of the few countries in Europe where Islam, not Christianity is the major religion. Though Albania was officially and forcibly atheist during the Cold War era of Communist rule, today around 57% of Albanians are practicing Muslims, while just 10% are practicing Catholics and just 6.75% practice Eastern Orthodoxy. An Ottoman province from the 15th century until its independence in 1912, Albanians had hoped that Brussels would acquiesce to its EU membership application in 2012 to mark the centennial of its independence. Albania joins five other official EU membership candidate countries, though none of them are imminent EU members. Iceland, which applied for membership in the wake of the 2008-09 banking crisis, suspended negotiations with the election of a new center-right national government last year. Turkey, which has been an official candidate since 1999, seems no closer to membership today, given longstanding opposition throughout many current EU member-states. Macedonia, a candidate since 2005, hasn’t even initiated negotiations due to tensions with Greece over its name. Montenegro began negotiations in June 2012 and Serbia began negotiations in January 214, but both countries could be a decade off from EU membership, and Serbia’s membership has been conditioned upon a satisfactory resolution of Kosovo’s status. Croatia is the most recent member of the European Union, which officially acceded in July 2013 as the 28th member state. Previous PostReady or not, Libyan voters will elect a new parliamentNext PostHong Kong: One country, one-and-a-half systems?